West Lothian’s Community Safety Unit is calling on residents and businesses to store all bins securely to avoid them becoming a target for fire-raisers. Each year hundreds of wheelie bins are stolen, with many being set on fire causing damage and disruption to individuals and properties. In West Lothian, bin fires cost the taxpayer over £200,000 each year, in addition to repair costs. 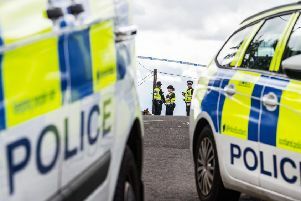 The Community Safety Unit, which is made up of officers from Police Scotland and West Lothian Council, also reported bin thefts in East Calder and Deans, Livingston. Sergeant John Jackson said: “Wheelie bin fires occur across the country throughout the year and we are keeping an open mind as to whether recent incidents are linked. “I would urge all residents to take the necessary precautions to help avoid their bin being taken or set alight. Bin fires can be as dangerous as any other fire, as was revealed in the Gazette last week, and can quickly spread to properties as a result of proximity. Executive councillor for services to the community, George Paul, added: “Residents can play a very important role in preventing bin fires. The most important step that anyone can take is to simply store bins away, especially at night. Another practical step is to make sure that rubbish does not pile up close to buildings. Help to prevent bin fires by following these tips: Do not place hot items in the bin, for example: smoking materials, hot embers from coal/wood, etc, do not store rubbish or wheelie bins by windows or doors - any fire in the bin could easily spread to your property. Whenever possible, wheelie bins/refuse containers should be stored securely behind locked gates.Only place your wheelie bin out on your collection day.